A thoughtful carpenter erected a little house on a pole that holds about a dozen books. 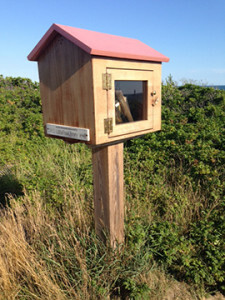 You can drop books off or take a book on your way down the steps to the beach. There’s a sign on the front that says “Little Free Library”. It’s beautifully made with a glass front door that opens and latches shut for easy use. It looks a bit like a large birdhouse. What a thoughtful citizen to do this!! Speaking of thoughtful, I’ve received lots of emails and texts from readers commenting on what I’ve written or making suggestions, i.e. : their own houses for me to check out. Most Nantucket homeowners are proud of their homes and lately, due to the subject of my new book, “Nantucket Cottages & Gardens” I’ve heard from homeowners with small houses. Eileen on Pilgrim Road has a few interesting ideas for decorating as do Kathy and Tom Ayers on Fayette Street. Keep them coming and I’ll put them together in a list of “great tips for living small” when I have enough to share. On Sunday Terry Pommett and I signed books at Mitchell’s Book Corner and were surprised at how many newcomers hadn’t yet seen the book. It was most gratifying to meet new first time homeowners from all around the island. It seems that a lot of people are interested in collections and want to know the best ways to arrange them. 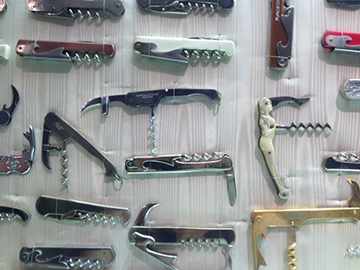 The Culinary Institute of America in California has a marvelous display of corkscrews. 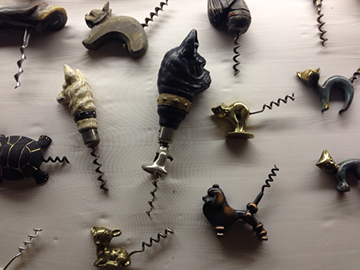 Not a big surprise in this Napa Valley region to find wine related artifacts. 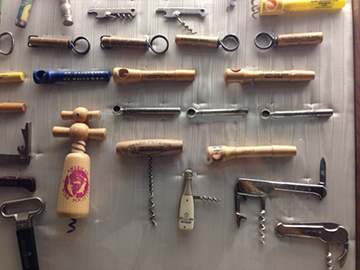 It was fascinating and got me thinking about what and why people start a collection. In Nantucket lightship baskets and scrimshaw are obvious choices. My brother-in-law has collected stamps all his life, from early childhood. I asked him what held his interest in this particular item since it’s not something that one displays. He is now in the process of having the collection appraised and this has given him the opportunity to go back over them page by page, reliving the experience of collecting from a different perspective. Some collections, like stamps, relate to design, history, geography and probably a lot more. A collection can be a timeline. People collect things when they travel. Some have monetary value, others sentimental value. Beware however, a collection can become a responsibility. When you have a few of one thing it’s enjoyable. I love looking at the mixing bowls I brought home, on my lap, from a flea market in the south of France. There’re on a shelf above my kitchen counters. I rearrange them every time I clean that shelf, amount once a month. If there were more they’d be a problem. There are just enough, in the right colors, sizes and shapes to make a nice display. If you are a collector and suddenly realize you have dozens of something, the joy and pride of ownership can turn into a burden. 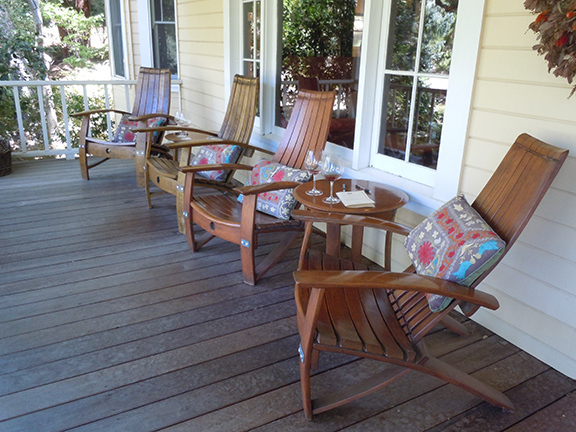 People who are downsizing often can’t decide what to keep and what to let go of. It’s a known fact that Americans love to shop. We have a passion for the hunt. Lately minimal is an attractive decorating style as people are craving a simpler lifestyle. So maybe it’s the perfect time to divest. Maybe that little five- dollar vase found at a yard sale will turn out to be made by Tiffany. For now I’m content to tear pages from catalogs and magazines of the “some day” purchases I intend to make. Who knows, by the time I can afford them I’ll probably be over wanting them and glad I don’t have the burden of unburdening. This could be the perfect antidote to a “collecting bug”. Clip it, paste it, look at it, discard it. Better yet, take pictures of your collections then get rid of things. When you feel nostalgic, look at the pictures.